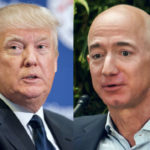 Amazon CEO Jeff Bezos came out swinging at Donald Trump and National Enquirer boss David Pecker last night, revealing proof that Pecker tried to blackmail him, and making the case that Trump was probably behind the entire thing. Although he didn’t mention it in his public treatise, Bezos has a theory about how his private text messages got into the hands of the Enquirer to begin with. All along, observers have assumed that some hacker got into Jeff Bezos’ phone, cloud, etc, stole his compromising personal photos, and sold them to the highest bidder, in this case Pecker. But Washington Post writer Manuel Roig-Franzia appeared on MSNBC late last night and revealed that Jeff Bezos and his investigative team now suspect that a “government entity” accessed Bezos’ phone. This is a doozy for a number of reasons. The only legal way for the U.S. federal government to secretly surveil the phone of a private U.S. citizen would be if a FISA warrant was granted because the person was legitimately suspected of plotting against the United States. We’re going to assume that Jeff Bezos isn’t secretly a terrorist, so such a digital wiretap would be in clear violation of the law. For that matter, you have to ask why on earth someone at an agency like the NSA would decide to illegally wiretap the CEO of Amazon. It’s almost impossible to imagine such a scenario unless someone like, let’s say, the President of the United States ordered someone at the NSA to carry out illegal digital surveillance. Of course the NSA would have then had to give the pictures to the National Enquirer, which would make absolutely no sense, until you consider that the President of the United States is friends with the head of the National Enquirer. If Donald Trump had the NSA (or come to think of it, the Russian government) steal private pictures off Jeff Bezos’ phone and then give them to the National Enquirer for the purpose of trying to blackmail Bezos, let’s just say that Trump would be gone from office about five minutes after the proof surfaced. Bezos is clearly angry, but he’s a savvy guy with a lot of lawyers around him. We can’t imagine he’d even hint at such a thing unless he has good reason to suspect it. This rabbit hole could get very deep very quickly.